There have been a couple of beautiful weather highlights lately. First, there was this 180 degree rainbow a few weeks back, following a brief thunderstorm and rain shower. This is at the farm, looking east toward the Mekong and Thailand. Looking east toward Thailand. 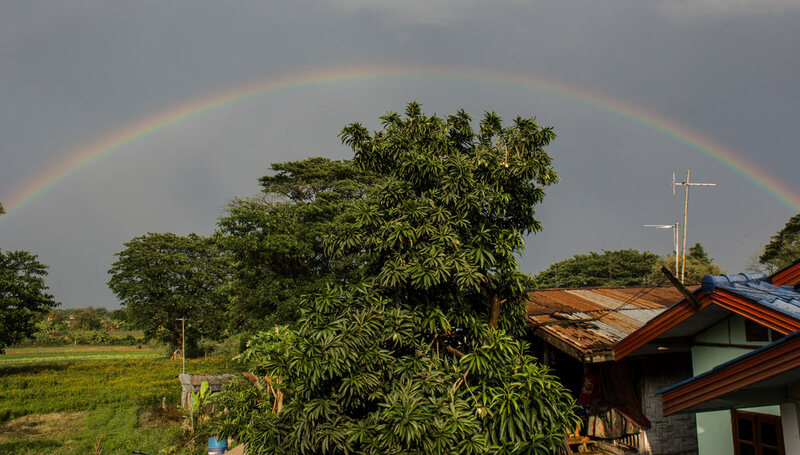 Lovely 180 degree rainbow after a brief rainstorm. I fooled around in Photoshop and made this partial black and white photo of the rainbow. Fun to do and not too time-consuming. 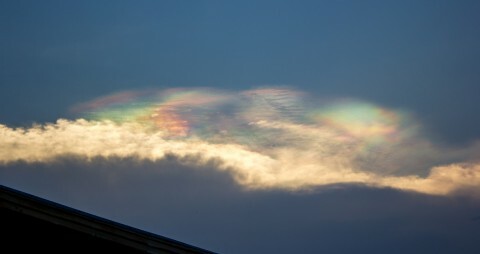 Just a couple of days ago, this weather phenomenon, iridiscent clouds, topped a large cirro-cumulus cloud. I posted about another occurrence that we had last year. They’re unexpected, but beautiful. The large storm cloud never did get any closer to us, but sailed into the west. After twilight the horizon was aglow with lightning flashes, presumably from our cloud. Iridescent cloud, looking west about an hour before sunset. The black streak in the lower left corner is the eave of our neighbor’s house. Unavoidable, in this case. I used my telephoto lens for this one to try to capture a close up shot of the right side of the photo above. Our four-week vacation is over, as the second trimester of the year is about to begin. Each trimester lasts thirteen weeks, so I’ll be working through all of May and the first half of the rainy season, June and July, before getting another long break in August. The time off is nice, but it gets boring near the end. Plus, it’s unpaid time, so it’ll be good for the pocket to be back on the pay clock again. Also, being back at the school will give me better access to the Internet, so I’ll be able to post more often and check in on Facebook. Out here at the farm, the connection is spotty and slow most of the time. I’m on a metered connection, so when things are actually working well, it does get a bit expensive. Always two sides to everything, I suppose. Slow and spotty = cheap; fast and reliable = expensive. Usually, I’m fine with slow and spotty. Another advantage of being back to work is that the school is air-conditioned. The heat has been extremely oppressive the last several weeks, with daily temperatures usually topping out over 100 degrees F. (38-40 C.) That’s too much for comfort. We have a couple of fans at the house that are almost always on, but they don’t help much during the peak heat hours. I’m looking forward to the rainy season, which brings somewhat cooler temperatures. Again, though, the other side of the coin is that there are many more thunder storms and the lightning often knocks out the power for several hours. No power = no fans. Since many of these storms hit during the night, trying to sleep without the fans cooling us off is very difficult.